First, I want to say I have missed writing for you, my loyal readers over the last couple of weeks. I have been up to my eyeballs in design projects and also needed to catch my breath as I go forward. I have researched and thought extensively about a lot of ideas for future posts during this time, as well as refining my ideas about my blog as I reach completion of my first year blogging. I will write more about that milestone in another post. 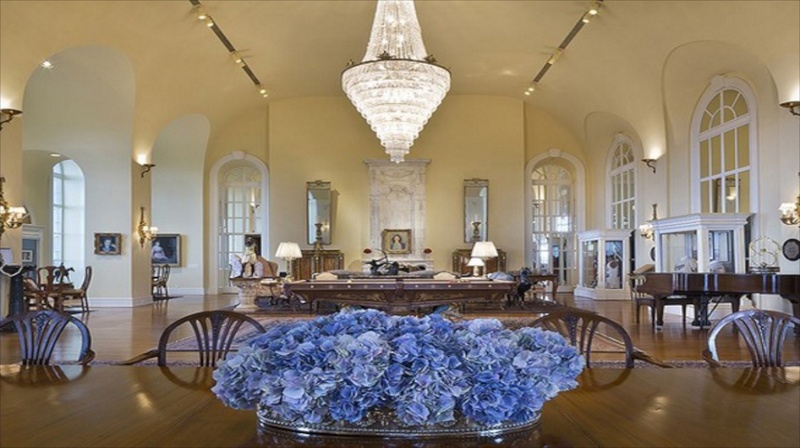 Today I would like to share with you a home that was the most expensive private single family home to ever hit the market in the U.S. It just sold for $120 million. 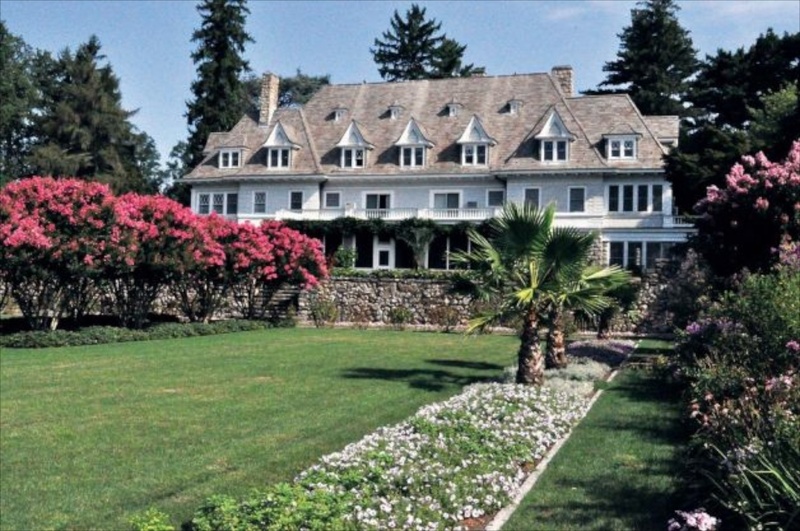 The next most expensive property was sold in California for $117 million. This is an amazing property, and what thrills me the most is that, although it had been approved to be subdivided, it sold with the full 50 acres intact. When you see this home and property, I think you will agree that it should remain in a single piece. Few large homes built today have integrity, and especially history. Few homes like these are considered sellable, especially with the price tag attached. 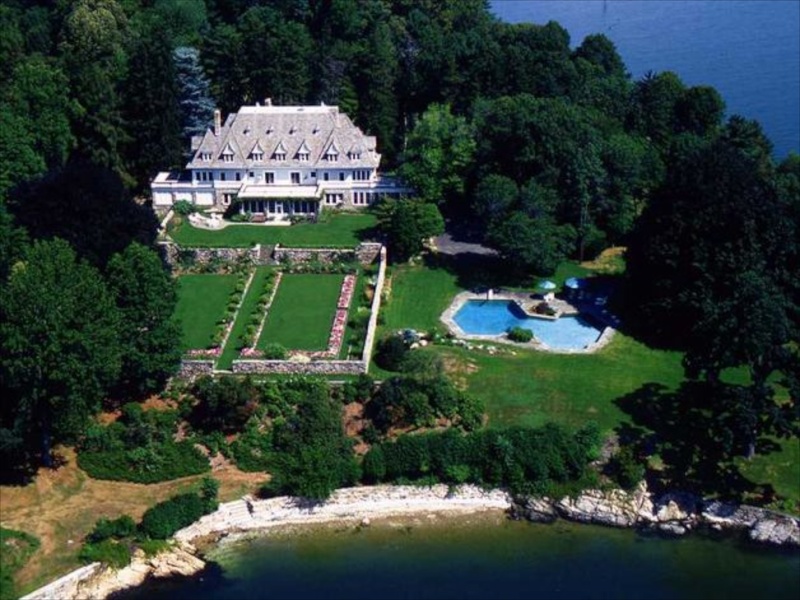 Originally the asking price was $190 million, so it sold for a lot less than the original asking price. 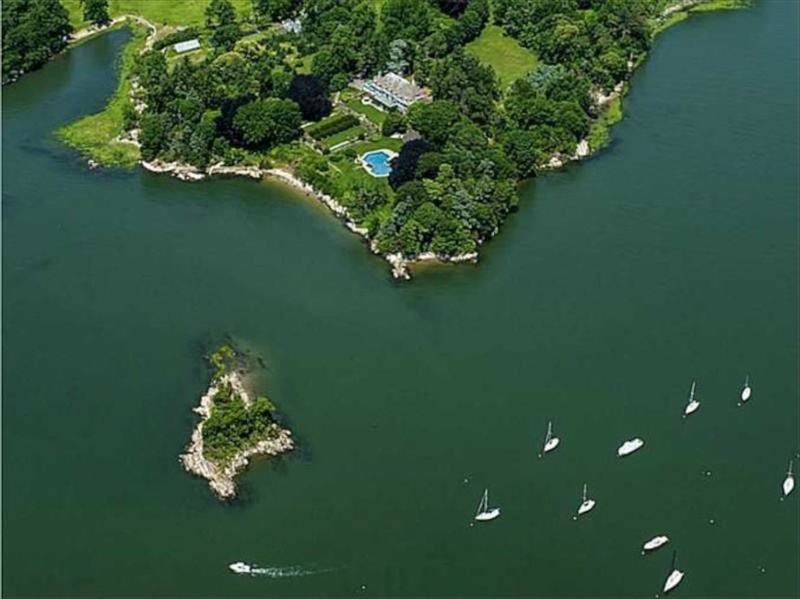 Known as Copper Beech Farm for the magnificent Beech trees on the property, it is located in Greenwich, CT, is on the waterfront, and for privacy reasons, the new buyer has not been disclosed, other than to say it is not a local buyer. 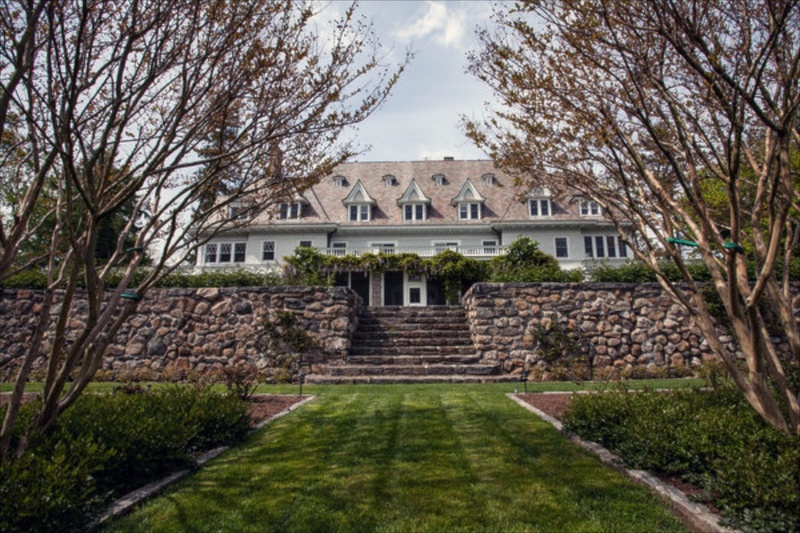 The home has been a landmark in Greenwich for generations and was really a farm at one time with chickens, pigs, and orchards. 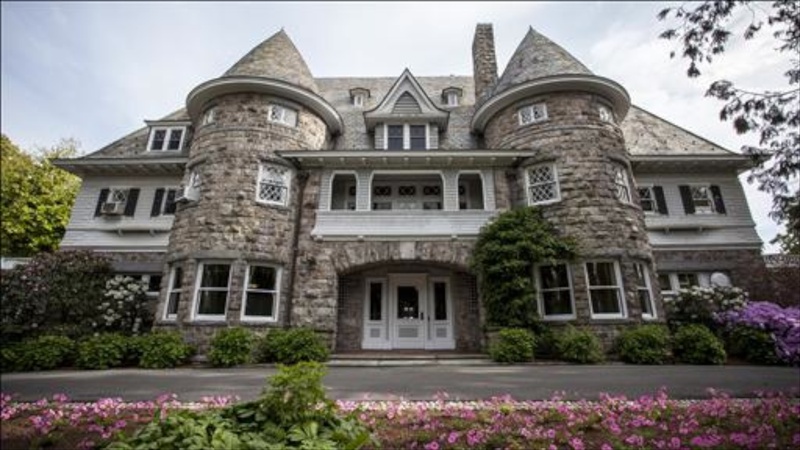 It was built by New Yorker John Hamilton Gourlie in 1896 and originally consisted of 57 acres and at one time had grown to more than 100 acres. 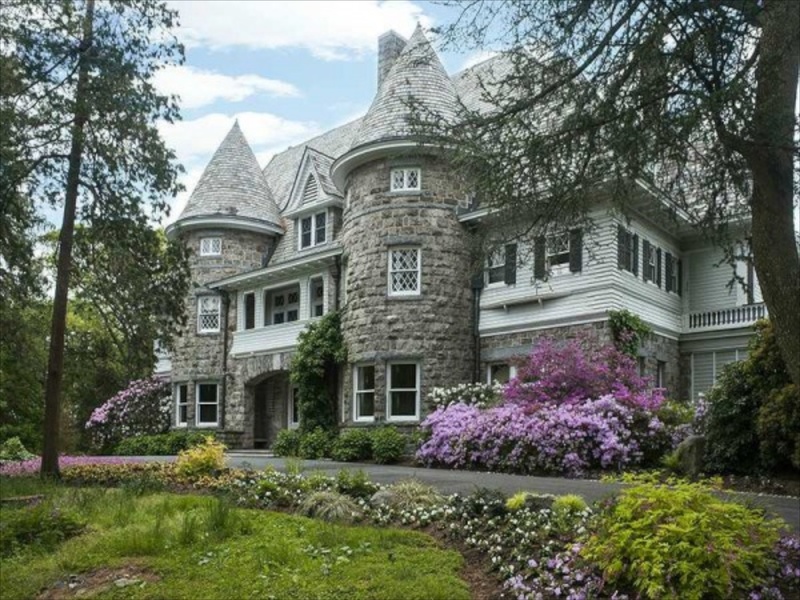 It changed hands in 1905 when Harriet Lauder Greenway, Andrew Carnegie’s niece purchased the home in 1905, and in 1910 or thereabouts, the Lauder-Greenway family added two wings, which was quite common during that time. The Lauder-Greenway family then began donating land to various causes, including an island donated to the town and now a popular place known as Island Beach. They even donated the ferry to get folks there. After Harriet and Jame’s son died in 1981 the property was privately sold to John Rudey, a lumber magnate. The reason for selling now is that his children are now all grown. 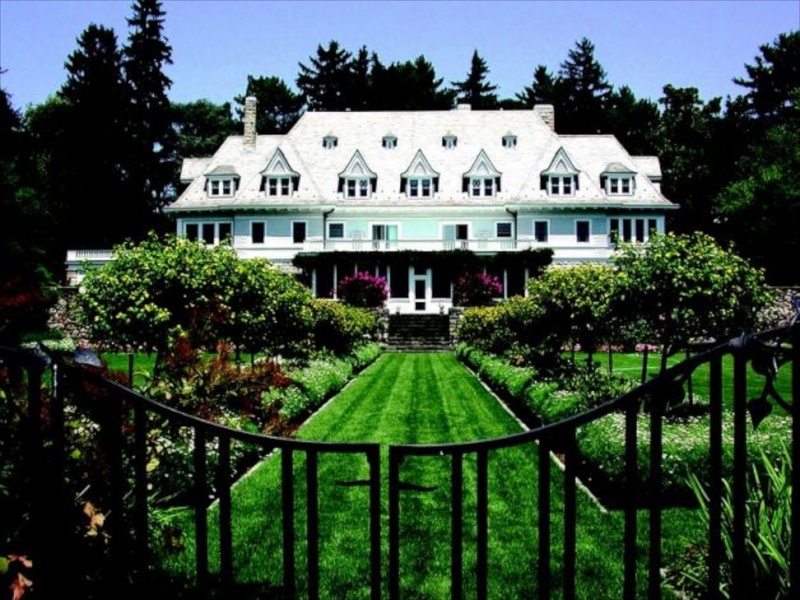 Back in 1981 when Mr. Rudey bought the property, he paid just $7.5 million. He also put 45 of the 50 acres into forest which handed him a tax break of about $720,000 a year. 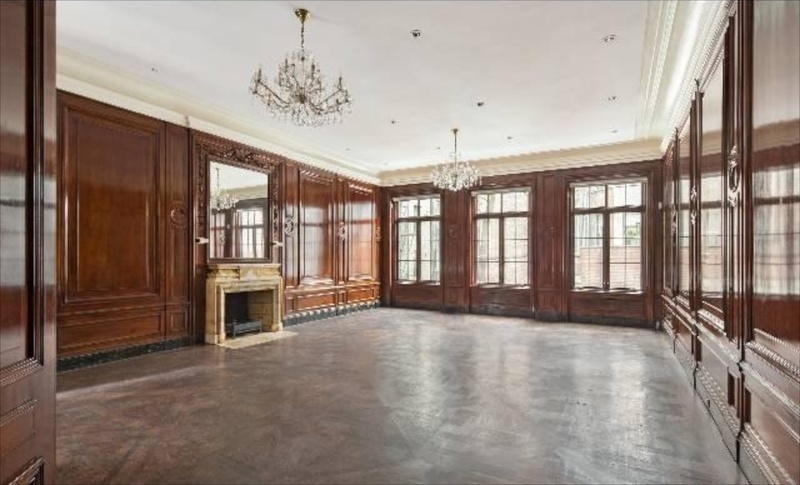 The property, according to WSJ’s Alyssa Abkowitz, is in good condition, but needs upgrades. The main kitchen is in the 7,000 sq. ft. basement, which also housed staff quarters. There are old speaking tubes from pre-electricity days. 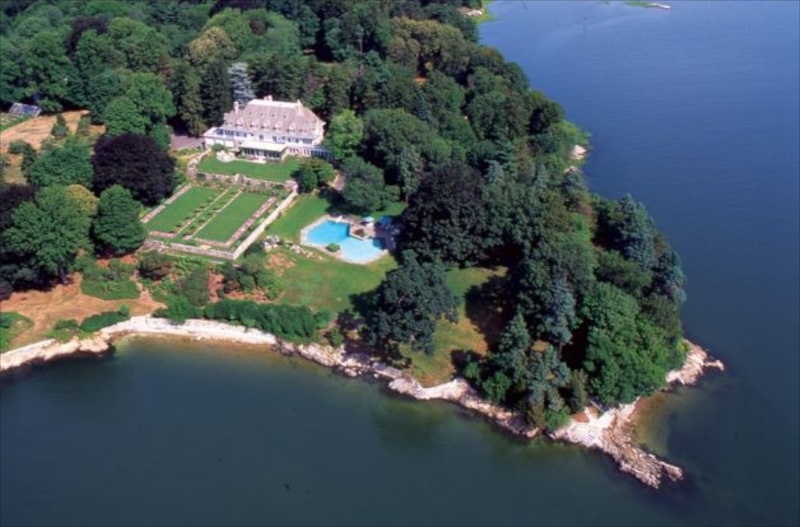 Although the majority of the value is in the land, it is hoped the new owner will not do what is typical in Greenwich and elsewhere…..tear down the house and build another mansion, and worse, divide up the land. The potential to take this home to updated and stylish exists and one can only hope that the new owner will do just that. As we say in design….this house has great bones. 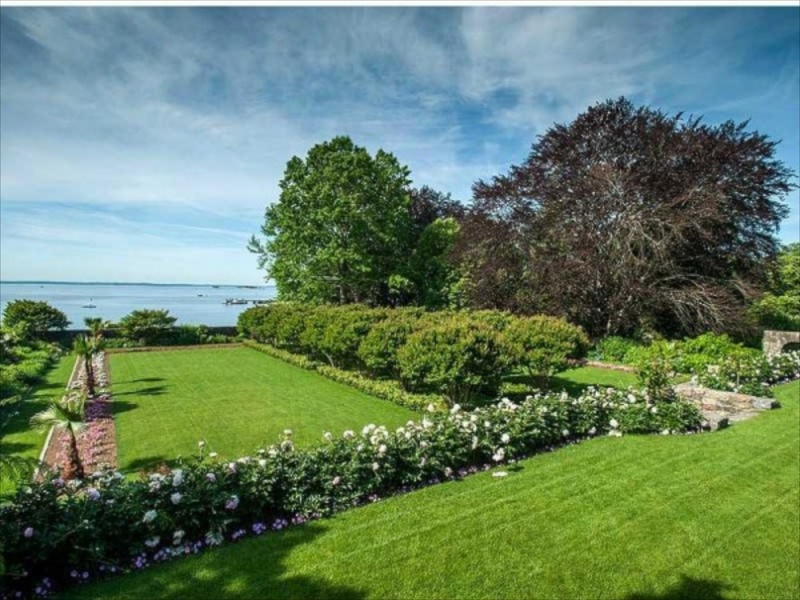 The property, on 50 acres, has 4000 feet of private beach frontage on Long Island Sound. You can also see some of the magnificent Beech trees after which the farm was named. Although not visible through the trees, there is an 1800 foot long cobblestone driveway that leads up to the front door. It also includes two small islands, one of which is visible in this photo. It would be kind of romantic to take a small boat out to the island for a getaway, perhaps a picnic or to camp overnight. 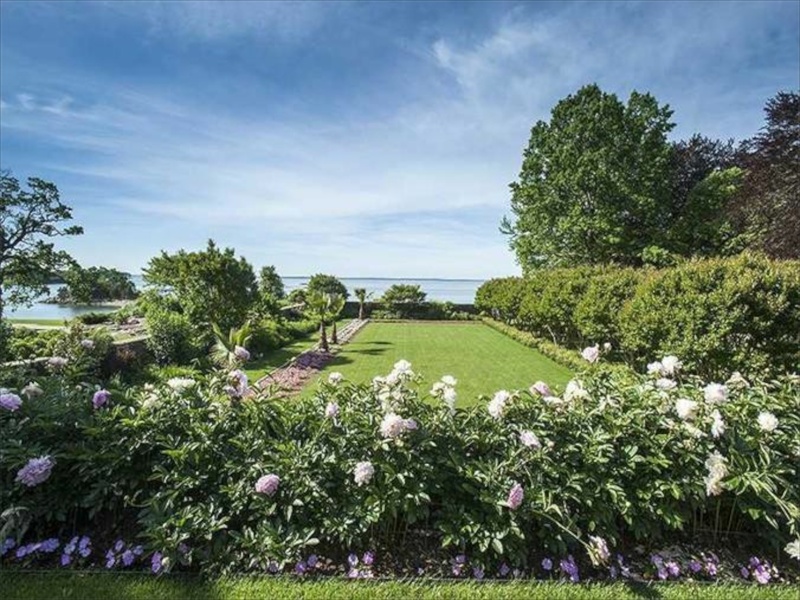 This view is of the back of the house, facing Long Island Sound. A glimpse of the gardens here, more details to come. 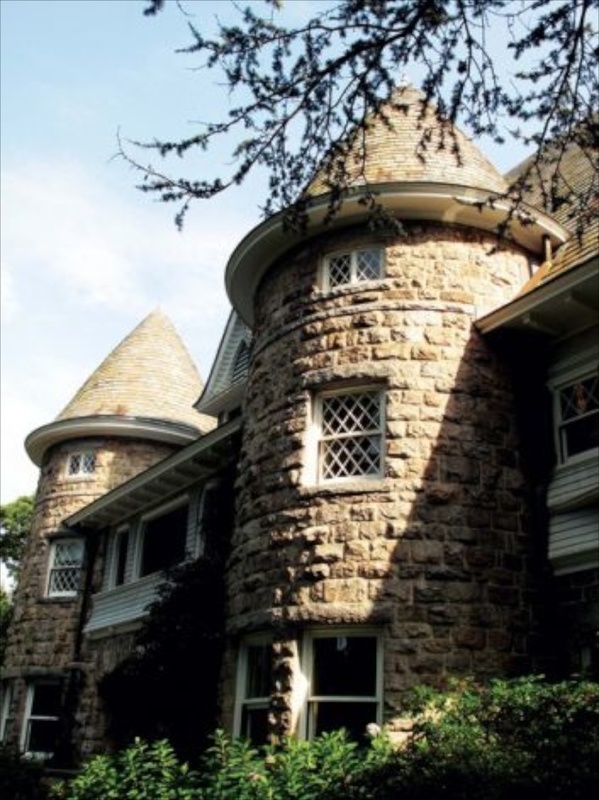 Front view of the stone and shingle home, which consists of almost 15,000 square feet. That figures out to about $9616 per square foot!!! 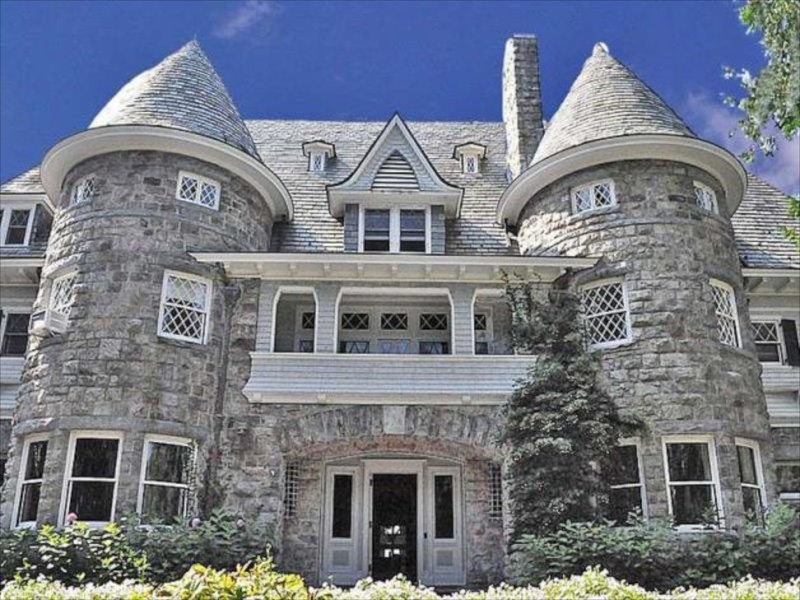 This home was built in 1896 and has strong Voctorian and French Renaissance influences. The deep trim, round soffits and many other architectural details combine to give this home tremendous character. The glass windows in the tower are actually curved. The stonework is to die for. We see so little of this quality in todays mega homes. 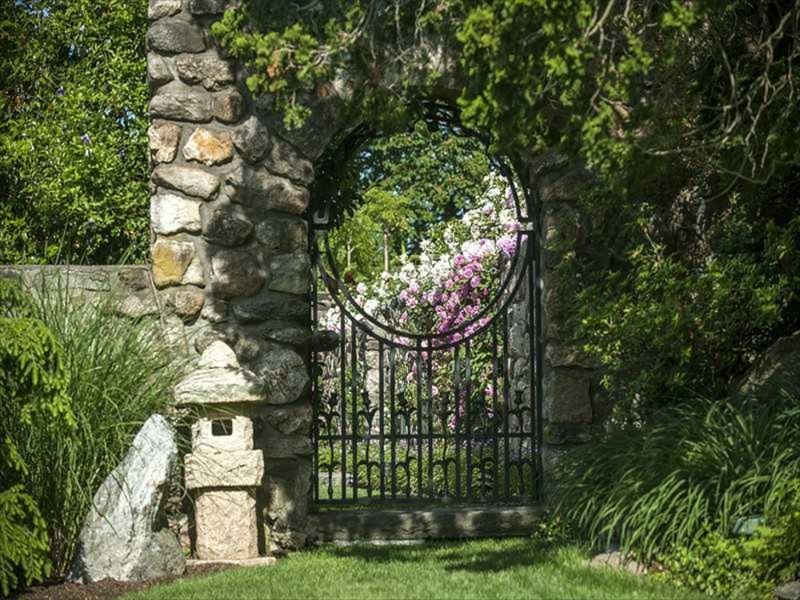 From this back view, we see the stone walls that encompass the gardens closest to the house. These are tall walls! The Crepe Myrtles are bare in this photo of the lower gardens. Here the Crepe Myrtles are in full bloom creating a beautiful allele and forming an axis from the house to the waterfront. 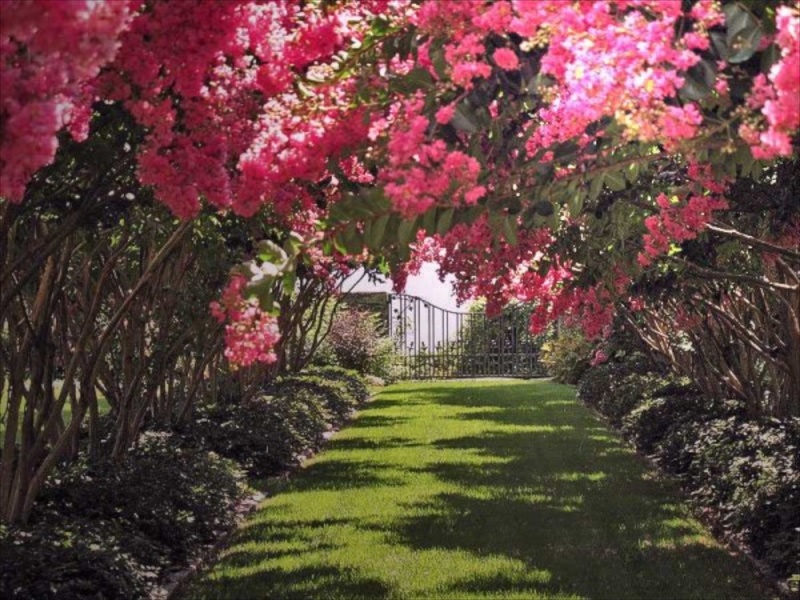 These are very mature Crepe Myrtles, and what is remarkable is that they are not known as a small tree able to survive the northern climate at all. At the top of the stone stairs within the stone wall are the upper gardens. 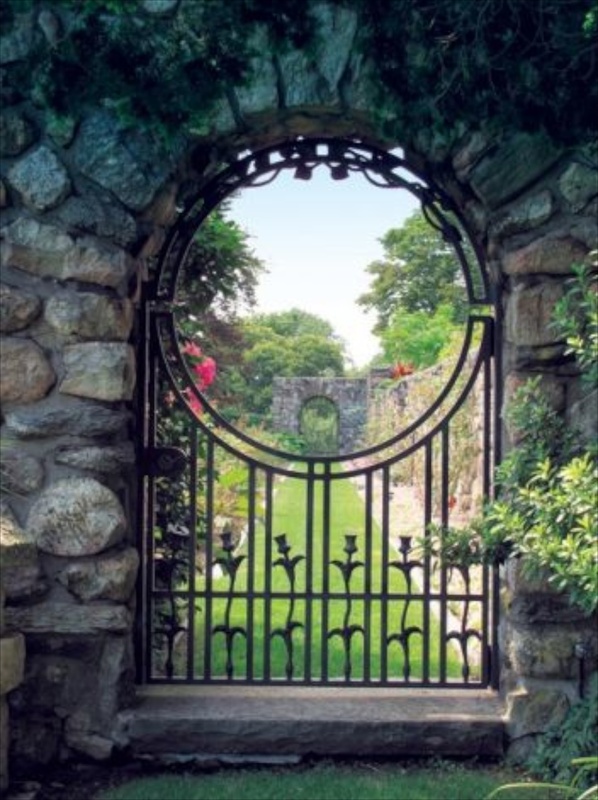 This wrought iron gate set into a stone archway, reminds me of a secret garden. Looking directly through the gate, we see that again, the gardens form an axis. The detail at the bottom of the gate is lovely and whimsical. Another view of the Crepe Myrtles, and off to the right, Palm trees. The two sets of two different sized dormer windows keeps the roof from dominating the back of the house. The symmetry is exquisite. 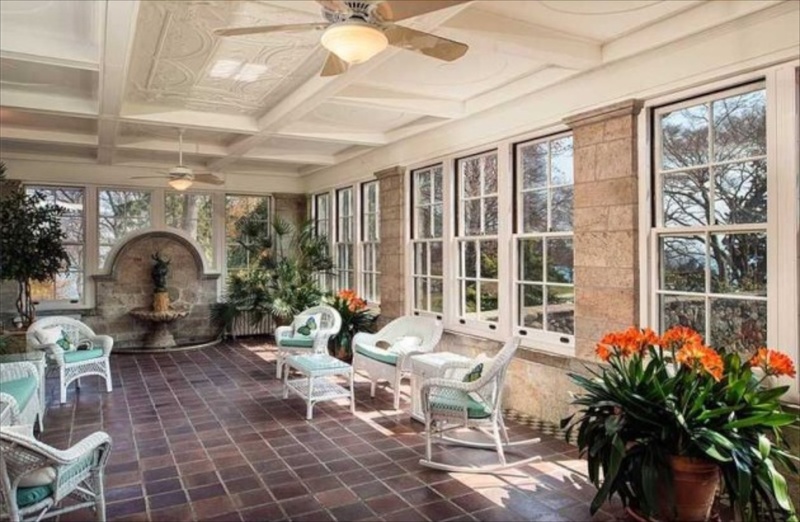 In this view of the upper gardens just outside the porch/sunroom, it almost appears tropical. Quite amazing, since this is the CT. shoreline, known for anything but warm winters! 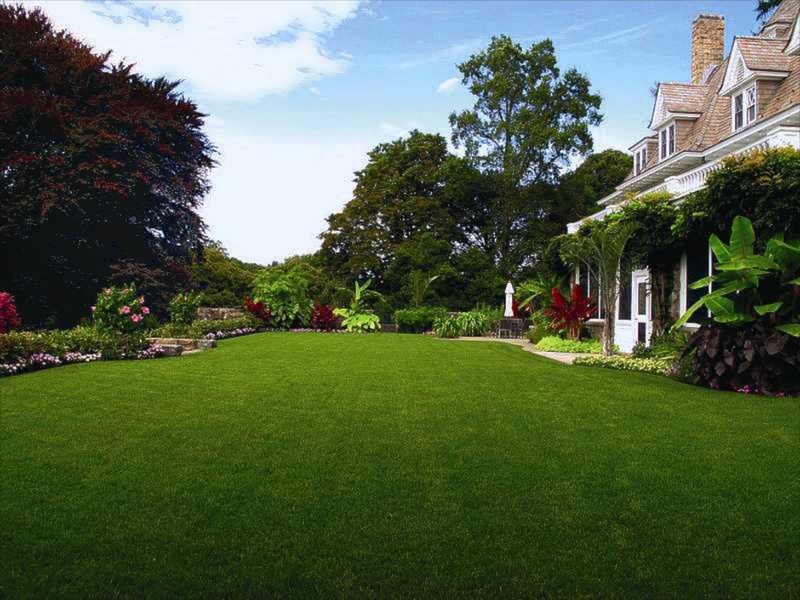 What fun to play catch, croquet or bocci ball in bare feet on a summer day! 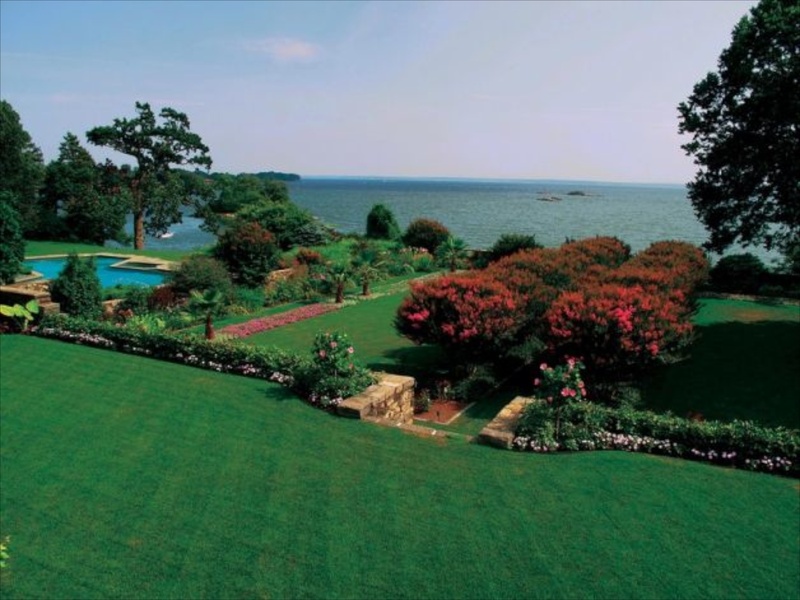 This view, from the house, shows an incredible water view, as well as the scope of some of the gardens. You can just see a glimpse of the swimming pool off to the left. 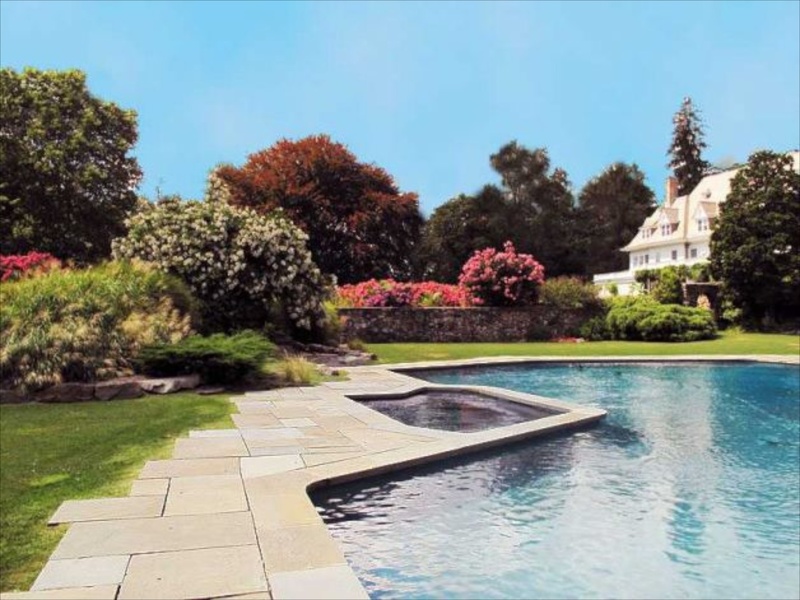 The octagonal shaped pool is 75 feel long, is heated, and also features a large spa, dressing room and delightful stone terraces and a continuation of the gorgeous landscaping. 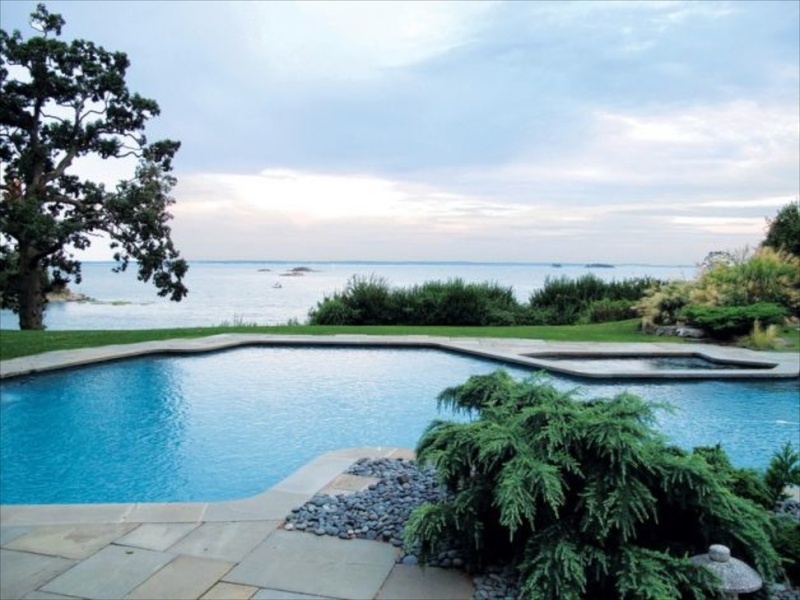 The pool offers the same amazing views as seen from the house. The weeping evergreen shrubs soften the hardscape. I love this room. Large and bright, with barrel vault ceilings, and the curves continuing in doors and windows. To the right is a glimpse of the grand piano, which gives you a sense of the scale of the room. However, because of the placement of the furniture and the exquisite architectural details in the ceilings and walls, it is a scale that certainly does not seem overwhelming. To the left, the curved columns that reach to the ceiling, flowing right into the barrel vault help in this result. The room would not have near the warmth and human scale without them. The fireplaces throughout the home are all hand carved, and continue the luxury found throughout the home. Look at the ceiling moldings. 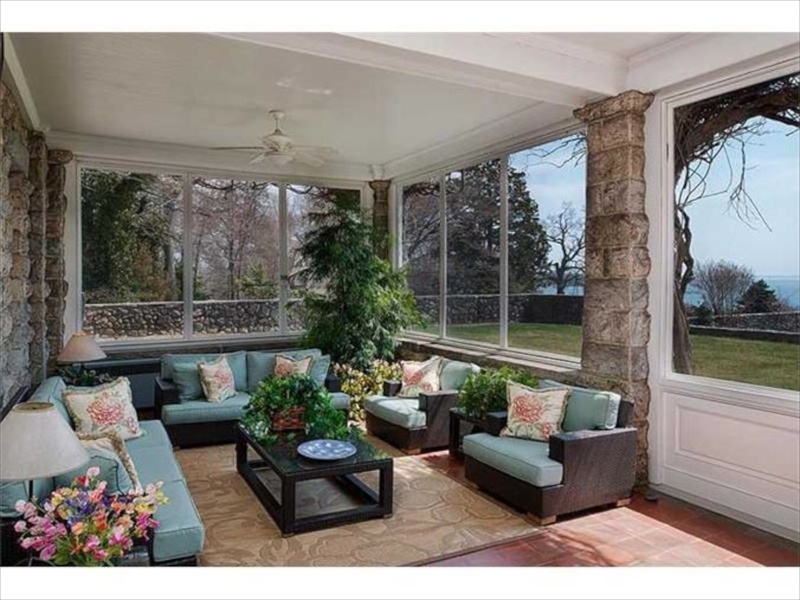 From this sitting room, you have direct views and access into the sunroom. Notice the fountain. The fountain is the one also seen in above photo. Again, we see the craftsmanship here in the solarium…..the windows were made to curve around the overmantel of the fountain, thus allowing for even more of the outside to be visible inside. If you look again at the photo above, you can see how this detail allows the eye to travel outside from both rooms…..again……use of axis in designing the gardens and home. 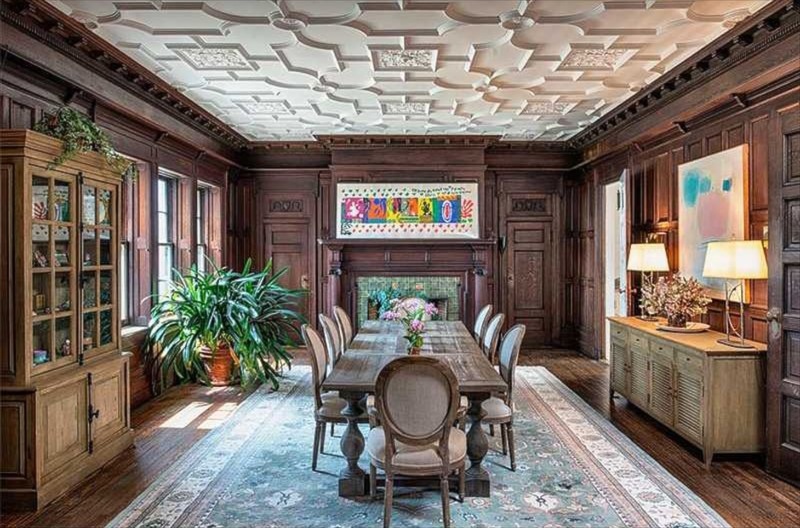 And how about the ceilings in this room? Another sitting porch -sunroom area. The door to the right leads directly to the upper garden and that wonderful lawn area, and also has the direct views of the waterfront and gardens. 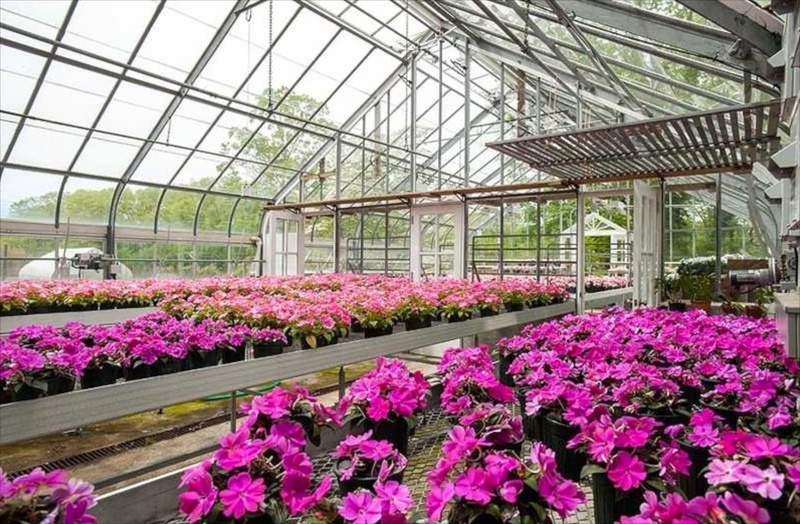 And yes, this estate has two greenhouses, as well as flower and vegetable gardens. What I wouldn’t do to have this to foster my gardening habit! Looks like New Guinea impatience growing to plant in the garden beds. The garden spaces also include an apple orchard. I really like the color tone on the paneling. Against the cream ceiling and the light carpet, it does not seem dark at all, but rather bright and modern. 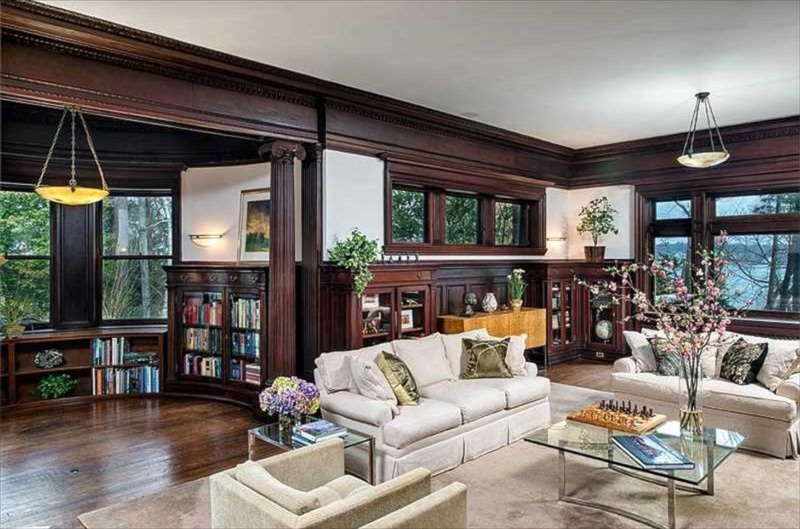 The carved fluted columns framing the doorway, and carved woodwork adds additional elegance to this room. I like the juxtaposition of the formal dark wood tones with the more casual and lighter wood tones of the furniture. The modern art is a surprise foil, and the tracery plaster ceiling is amazing. 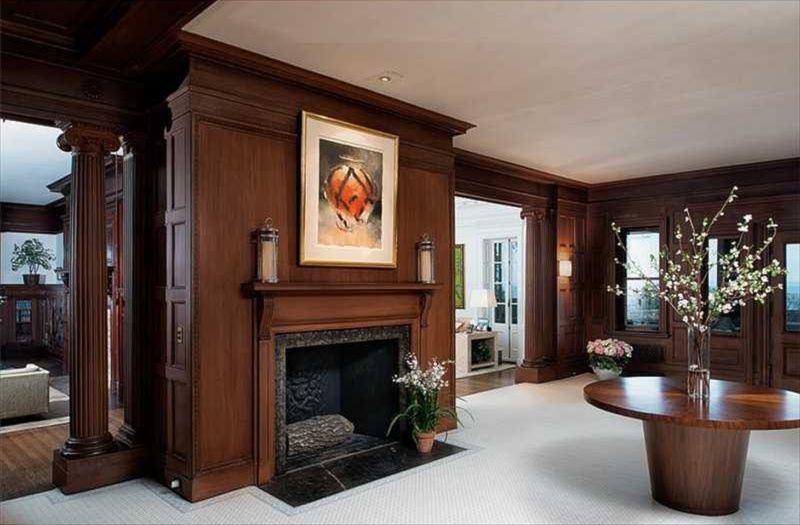 More deep moldings and carved paneling and fireplace add details, details, details. 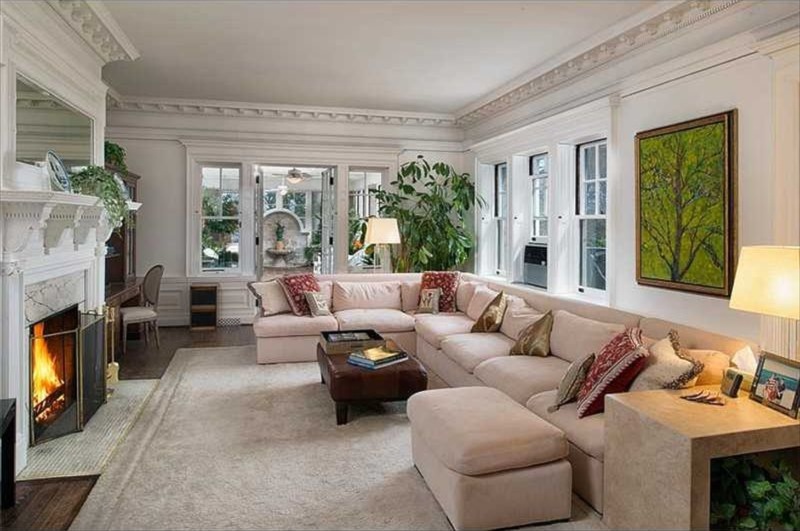 Notice the radiator covers under the windows, and the bookcases to the side of the fireplace, set back to provide visual relief in this long room. The view outside the windows continues the axis. Days long gone…..formal parties, dances, and more in your own ballroom. Today, I might guess you would see the occasional skateboarder. 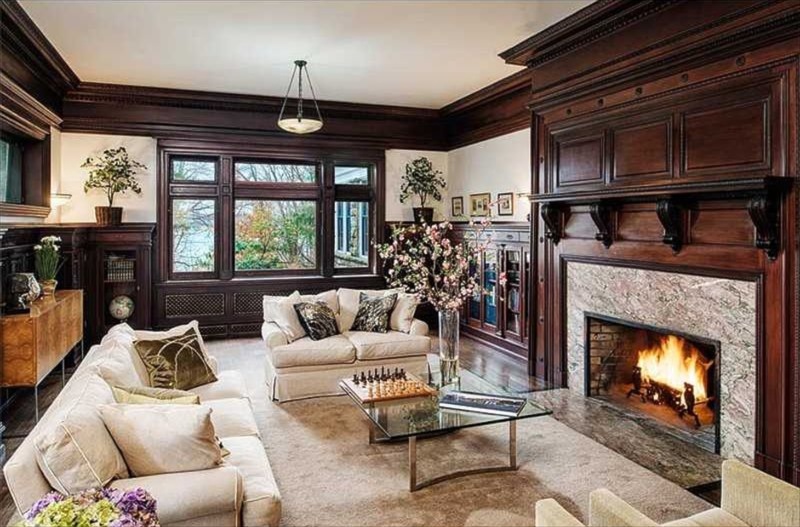 The carved woodwork details, especially around the fireplace are so to be admired. The entire property appears “soft”, no harsh lines. The trees bend, the homes demeanor is curvaceous, all details carefully and diligently thought about when the home was built. 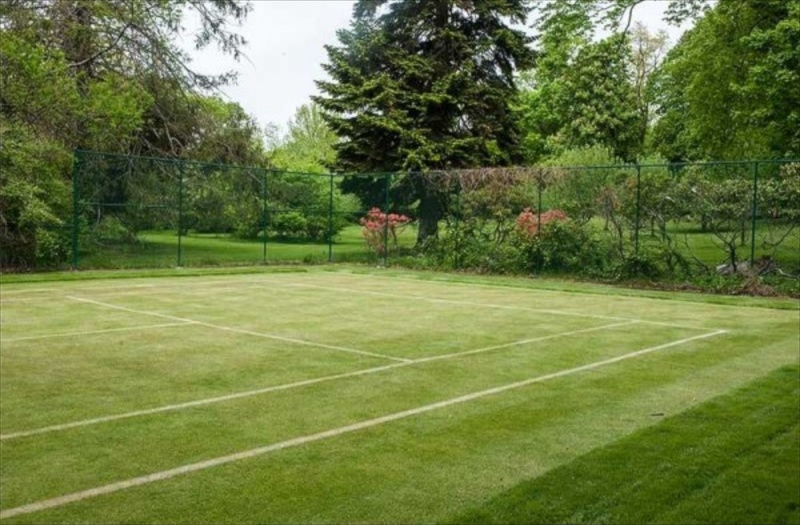 A grass tennis court awaits you. Another view of the homes exterior, with blooming azaleas and many other spring flowers in full color. The color of the Beech trees is such a nice contrast to green. Peonies bloom in mass in another section of the garden space. To the left you can just about see one of the small islands that are part of the property. Long Island Sound is beautiful, as this view attests. Not a bad place to call home. I am in love with every nook and cranny of this magnificent home. I would be devastated if it was torn down. It’s too bad someone didn’t get it designated as a historical home. 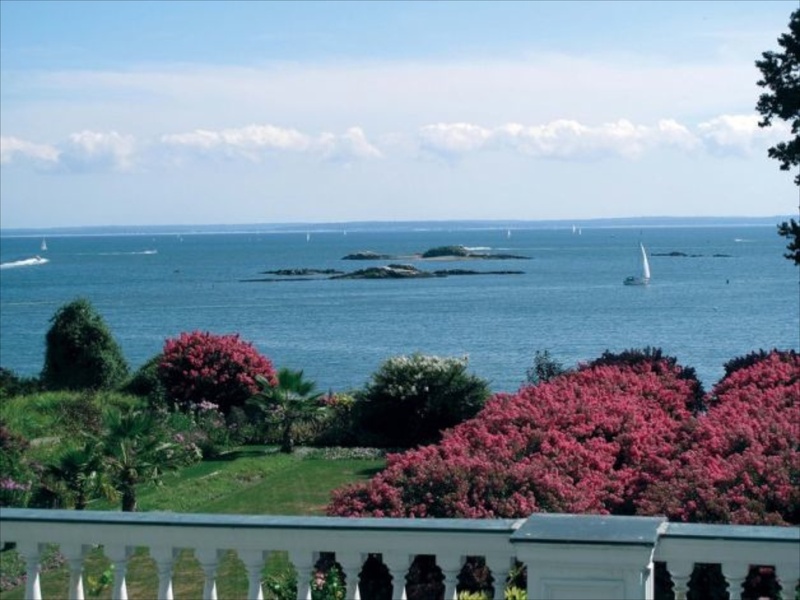 Seeing the views of Long Island sound brought back lots of wonderful memories of years past, being out in the sound just hugging the shoreline, looking at all the beautiful homes on the waterfront; fishing for dinner, or just enjoying the outdoors. That is the one thing I miss the most, not living near the water anymore and smelling the distinctive scent of salt water. So glad you are back, really missed your blogs! I’m back and happy to be so. Your memories are similar to mine, but of the Cape and the Finger Lakes. I do love the water and miss it so much, as do you. Special memories though, and that makes us luckier than many! Happy Easter to you and yours. Hi Charisse!! It is so very good to hear from you again! Sounds like you have really been busy. stone work, poole, “secret garden” gate, I could go on and on. This was a lovely visit . I bet the video was stunning as well. Really ready for a long stretch of spring weather myself! But the moon has been amazing this week. Took a few photos last night. Happy Easter! To you and yours! The moon and stars have been amazing, in part because of the freezing cold! I hope we are over the hump now and can enjoy a bit of spring weather. These old historic homes that have only had one or two owners are amazing. I am hopeful that the owners will update and decorate and enjoy it for many, many decades. Thanks for reading. Happy Easter! Hi Barbara, I also noticed the A/C window units in the towers as well. Even with ocean breezes, it can get hot and muggy for sure. The inside of this home has so many architectural details and will hopefully be saved intact with necessary updates, like the A/C and a kitchen upstairs. I can’t imagine wanting a midnight snack and having to go down to the basement, as I am sure any servants have long been in bed! Happy Easter!